Dates:Tues,.Sept.10th (check in). through Sat,.Sept.14th (Reunion Dinner). 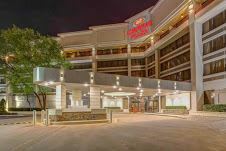 Place: Crowne Plaza Baton Rouge, 4728 Constitution Ave.,Baton Rouge LA, 70808. Reservations can be made by calling, 800-678-4065. Remember to mention the USS Galveston Reunion to receive our discounted rates: single or double are the same $104.00, per night plus 16% tax. Included is a full breakfast buffet, for 2 people per room. Check in is 4 PM, and Check out is 11 AM. Parking at the Crowne Plaza is free. Airport transportation is $7.00 per person each way and can be arranged by calling 225-930-0150. Cut off for Hotel Reservations at discounted rate is August 10th, 2019. Wednesday, Sept. 11th. Coach bus leaves Hotel, at 8:00 AM to New Orleans; (90 minute ride) to be dropped of at the Hop on Hop off Depot. This double decker bus travels a route through New Orleans. Just like the Red Train in St. Augustine -- get off and explore, get on the next bus that comes by, Depart New Orleans for the Hotel at 4:45 for 90 Minute return ride back up the highway. Thursday, Sept. 12th. City Tour of Baton Rouge. Pick-up 8:30, at Hotel. At 10AM we will have a Memorial service on the fantail of the USS Kidd DD 661, along with a tour of the Destroyer and their Museum. Upon departing USS Kidd, we will stop for lunch (on your own) around 1 PM, at the Market Place with a number of establishments, from Cajun or Pizza to burgers. After lunch, continue on the City Tour, with a stop by the LSU tiger display. Back to the Hotel around 4:30/5:00. Friday Sept. 13th, Business meeting at 9 AM for both Shipmates, and Gals. Auction news in next Reunion update. Friday Afternoon, Possible Plantation tour, Swamp Tour, or Casino trip, or all. Evening of relaxation, and Sea Stories in the Hospitality Room. Saturday Sept. 14th, Pictures at 4:30, open cash bar in Banquet Hall, 5:45 Parade Colors, and prayer, Dinner at 6 PM. Price for tours & dinner, and Menu are being worked out. Registration Payment Forms will be imailed this summer. In the meantime, if you think you will be attending this year, please go ahead and register in the (the REGISTER button at left) It helps us with our planning, and there is no financial commitment.